Hi all! 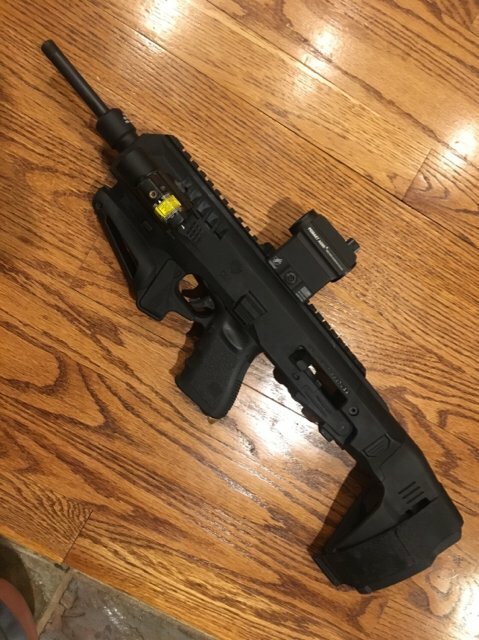 Below is the final installment (at least for now) of my evaluation of the Kel-Tec Sub2000 as an active threat response option. If you've been following this series, Thank you! As always, be sure to share your thoughts with me after viewing this final episode. I didn’t watch the first. Any plans to change the polymer trigger guard, polymer feed ramp and trigger? I considered one until I handled one at the LGS. The trigger felt gritty and the bolt was not smooth. I also considered doing mods to allow a red dot. This was probably going to become a costly project for me, so I decided against it. I was torn amongst this, an AR9 and a Ruger PC Carbine. Since I have a Micro Roni Stabilizer, and I like its ergonomics/size, I ordered a threaded 10” barrel to serve a similar function as above. 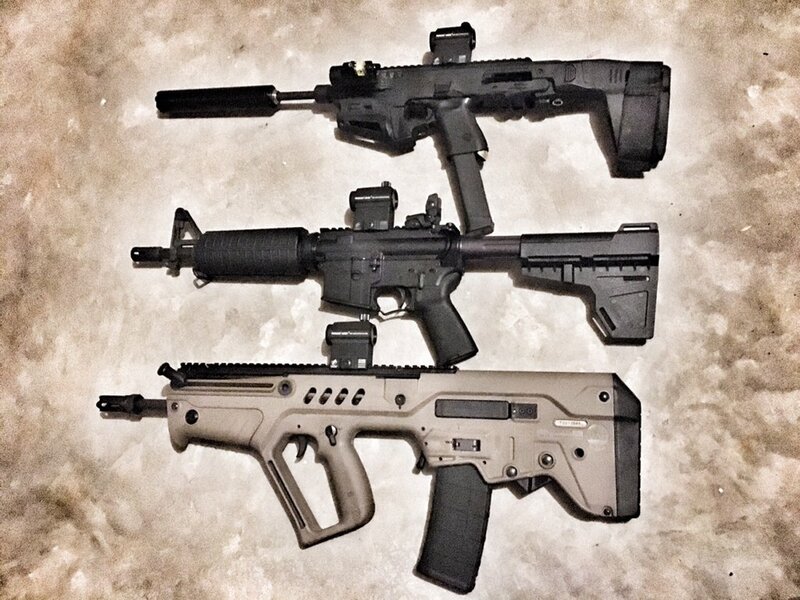 The CZ scorpion and an MP5 also muddy the waters amongst these different platforms. I upgraded the rear sight on my Gen 1 and totally agree with your assessed improvement of use! You can add a bushnell AR high mount red dot for about the same price as the irons option. Wouldn't allow full folding, but folded to a V, it still allows your gun to be pretty compact. For trigger, upgrading to a wider metal trigger gives significant improvement to felt trigger pull. As LE, I recognize you may not want to go the reduced weight. For the 40 cal sub 2k, there are also heavyweight charging handles that help to reduce felt recoil. Effectively like using a heavy buffer in AR since handle reciprocates w/ bolt. 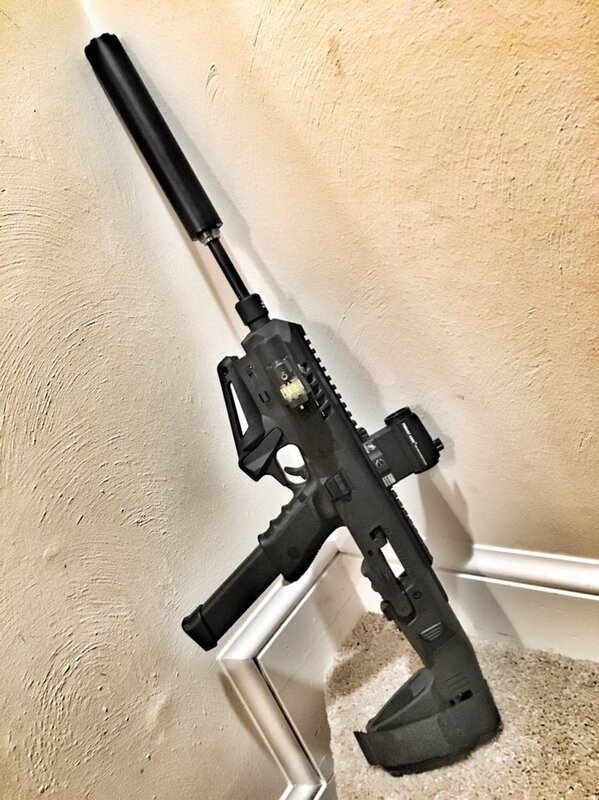 Bolt in 40 cals are already the heavy option that you can buy direct from keltec as well. Just a suggestion, but future multi-part videos, it would be great if you could keep in same thread. Really helps w/ continuity of discussion. Thanks for the comments and the suggestions! I've considered an optic mount that would work like the Bushnell you mentioned, but given my chosen carry method for the S2K it's important for it to fold completely. At this juncture, I'm looking at a 45 degree mount attached to the side of the fore-end. That would do away with any need to swivel, fold, or pivot anything. It would also negate any potential loss of zero attributable to the mount, and it would render the optic instantly available. I haven't fully decided on going that route just yet, but I'm leaning that way. You are correct in terms of my reluctance to alter any of the fire control parts. That could cause some unnecessary problems for me down the road. I'm also a little leery of adding the heavier charging handle. The added mass will slow the movement of the bolt and carrier (which is why the recoil is diminished), but I'm concerned it might also adversely effect the reliability of the carbine. If my S2K was purely a recreational firearm, I would probably be all for modifying the charging handle. For my purposes, however, a slightly underpowered cartridge could induce a failure (which would, of course occur at the worst possible moment). Because of that, I'll probably stick with the factory charging handle. With a 7-10 lb trigger pull a metal trigger does much to improve the trigger w/ no effect on the actual mechanical functions of the gun. Can't imagine that it would be a problem. Can't reiterate enough the dust cover. Trigger guard locks it in just like it locks in the barrel. Here: https://www.keltecweapons.com/dust-cover-451 Reduces potential to get stuff into the barrel and into the bolt/bolt tube. Sub2ks -- really the easiest fix for most folks' self defense use at self defense ranges would be a dual weapon light and laser. If mounting sight options to your HG, I'd recommend installing rail stabilizers that bolt to barrel and interface w/ HG to ensure repeatability. One benefit of offset is that it pivots the charging handle away from your body and anything likely to tangle it, but also make bird winging more likely, which isn't preferable when working corners. 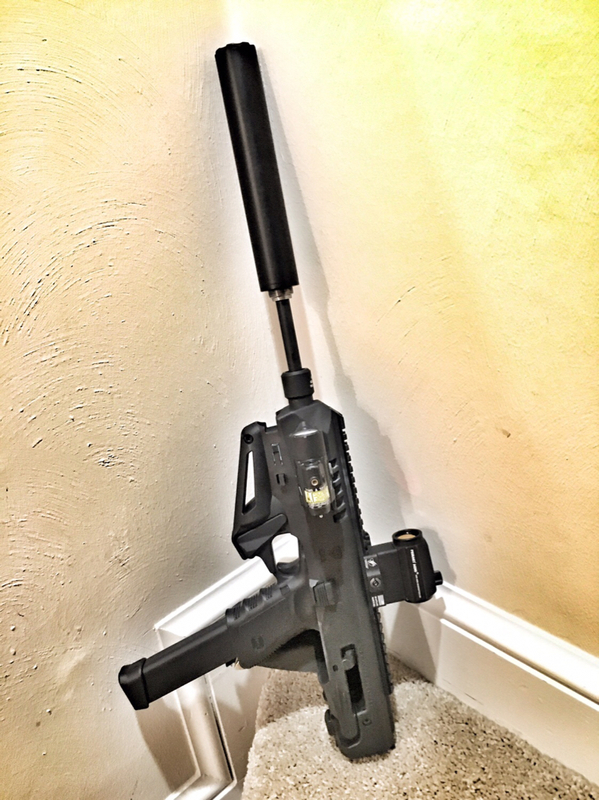 But I think you need to mount a rail and mount an offset to that in order to have folding clearance, which moves it more off the bore than you might like, potentially affecting cheekweld..
Don't get me wrong, I like the Sub2k, especially for what it is, but it's REALLY easy to spend $150-300 on prudent upgrades on the gun, with the lower # being upgrades I'd consider essential for fighting weapon. Vs the new Ruger PC9 carbine, I'm having an increasingly difficult time justifying the Sub2k over that gun, especially for rifle only shooters shooting that and perhaps a ruger 10/22... When considering upgrade cost, the Ruger comes out at least $100 and up to $250 less in accessories and considering usual $75-100 price difference vs sub2k, that's an even price to $150+ cost savings going the ruger route. Definitely food for thought. Sub2k is faster to deploy, more compact, typically lighter, and better for one handed control and firing. Definitely try the two finger changer handle, if you're skipping the heavy. Makes a major difference. I tried the poly cover for standard charging handle and it only succeeded in pinching my finger. Insofar as heavy charging handle, many 9mm Sub2k shooters have transitioned to heavy .40 buffer w/ no issues, which should suggest margin to transfer to heavy charging handle. And if it doesn't work, it's a 1 minute part swap. Effectively, I think it's fair to say factory spec is equivalent to AR w/ carbine buffer and standard spring, whereas upgrades can get you to AR equivalent of H1 buffer (if midlength, or H2 or H3 if carbine). Especially if all your duty ammo is +p/equivalent, you should be golden (I think recoil springs are same across both calibers, but might want to verify). I actually considered the Ruger carbine before going with the Kel-Tec. The biggest things that drove me toward the Sub2K were 1) the speed of deployment. Under stress I want the quickest, easiest platform to deploy; and, 2) the S2K could be converted to use S&W M&P magazines. Since I was paring it with an M&P (the same one that made an appearance in my second video), I wanted that compatibility. I'll look into the dust cover and the charging handle(s). Thanks again! Yes, for your needs, totally agree w/ the selection. Just noting the total costs of ownership rather than just purchase pricepoint, now that the discussion is accessorizing/upgrading, price-points between these two platforms converge. A tangent, but worth reiterating for folks coming through. There's zero reason that rugers can't have similar magwell conversions to sub2ks, but yes, they don't exist yet. Also, for extra/extended capacity mags, I personally lean towards glock mags over other makes as I find them to be more reliable/proven. YMMV. In fact, purchased glock pistols to pair w/ sub2k, rather than vice versa. But last purchased when Gen1 Sub2ks were all that were available, and none of options aligned w/ handguns owned. Again, appreciate you producing content, and appreciate you sharing your perspective -- and enjoy the seeking solutions/optimizations in a lot of your vids as well. I thought I would resurrect this thread for an update. Thus far, I've been carrying my backpack/messenger bag borne Kel-Tec Sub2000 for over a month. It has gone with me religiously when I'm working in the local school system. It has also gone along on several holiday shopping excursions (as a side note, the backpack has come in handy for stowing/carrying various items purchased during said excursions). It is obviously a bit more cumbersome than carrying a handgun alone, but once you become accustomed to it, it's not bad at all (so far, I haven't knocked anything off a shelf for bumped into another shopper with it). When times to remove the backpack have arisen, it has stayed beside me on a seat or on the floor between my feet. At all times in contact with me so I can feel it and know it is there. I am happy to report that no one has attacked the crowd of shoppers or a congregation of students while I've been carrying the S2K; but I find its presence comforting. As we saw recently with yet another terrorist attack on a Christmas shopping crowd in France, those who would kill us for simply not holding the same beliefs as them see this time of year as an "opportunity." The idea of armed and trained good guys in such an environment helps to ease my mind. Merry Christmas everyone! A practical solution. I've found for my own use a Micro Roni with the extended stabilizer works better. I have a Sig Romeo 5 mounted to the rail and backup flip sights too. I already had 2 Glock 19s and the sight, so spending $200 for the platform and adding the integrated light was a better way for me to go. I keep the kit with a 15 round mag in the pistol and a 32 round mag tucked into the open end of the brace. I stuff the larger mag in my back pocket as I lock the brace open. The whole kit fits neatly into a computer bag or small ruck. I already have a Roni Micro. So my solution was an 11” Barrel. I need to work on having it cycle with a suppressor, though. So I ordered a couple of sets of recoil springs for reliable cycling with a can. It works ok without a can. This is the comparison amongst my Tavor, AR-15 and the Roni with an 11” barrel. How much did this setup put you back? My rough estimate would be $550 Glock Handgun, $250 MicroRoni, at least $200 for the barrel = starting at $1k w/o any optic. That's ~2.5 Sub2ks at today's prices. Well, the Glock was free (look up Humpty Dumpty Glock). I paid for the Roni which was a Gen 2 at $330 and the 10 inch barrel was $180. Yeah, if I had to buy a Glock 19 it would be a lot more. 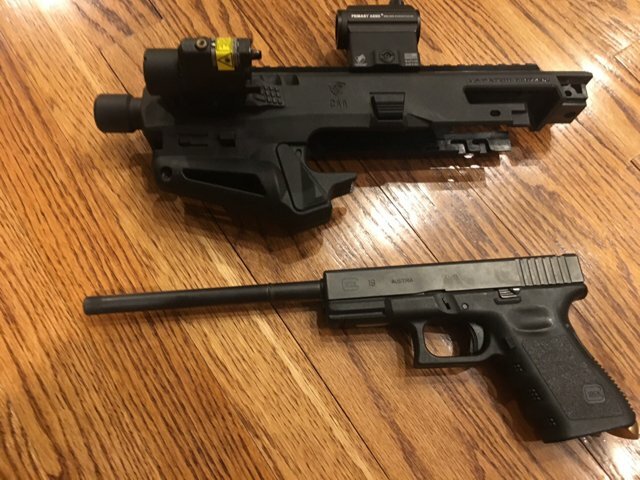 I have 3 Glock 19 and 1 Glock 19X.